This official Apple audio adapter allows you to connect your traditional 3.5mm audio accessories to your iPhone via its Lightning port. Ideal for use with earphones, headphones or speakers that use a standard 3.5mm AUX connection. This works well with the new iPhones. Good clear sound using this adapter, I had tried a couple of others from the high street first but the sound was crackling with those. As all Apple products , they were great . A bit more money than some others that are available but I am willing to pay the extra . With the new iPhones featuring no 3.5mm AUX port, using your traditional 3.5mm earphones or headphones might at first glance look impossible. 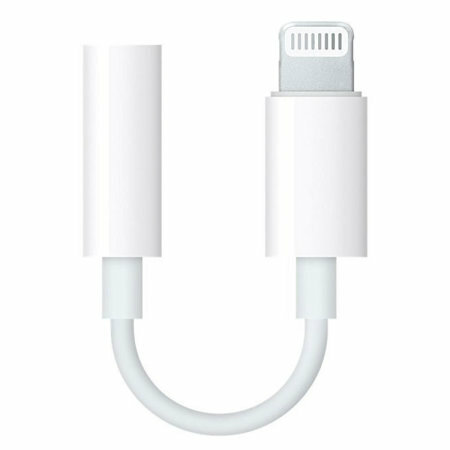 But fear not, because this official Apple audio adapter allows you to overcome the issue by passing the audio signal through the Lightning port. Just connect your iPhone to one end, your 3.5mm audio device to another and this tiny audio adapter will take care of the rest! Perfect for use with any audio device that connects via a 3.5mm AUX connection. Enjoy a high quality music stream with this official Apple Audio adapter. The sound passed through this adapter will remain of high quality, with no loss in bass or treble. This Official Apple Lightning to 3.5mm audio adapter is really compact and light - you will barely notice it being there! It will also add little to no bulk to your overall music listening setup, meaning you can still take it with you to the gym or on the trip. This official Apple Audio adapter features a high quality connectors, ensuring durability of the item. No matter what your usage looks like, you can always rely on this audio adapter. As this is an genuine Apple accessory, which can be used as a replacement or spare - you can be sure of the highest quality expected by the Apple manufacturing process and perfect compatibility with your Lightning compatible device.